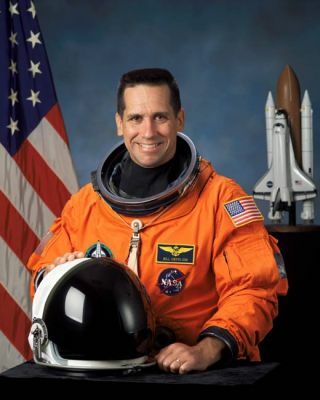 NASA astronaut William Oefelein, a commander in the U.S. Navy, sits for a preflight portrait. He is assigned as pilot for NASA's STS-116 mission aboard the shuttle Discovery. PERSONAL DATA: Born March 29, 1965 in Ft. Belvoir,Virginia, but considers Anchorage, Alaska to be his hometown. He has twochildren. Recreational interests include weight lifting, wake and snowboarding, fishing, and backcountry hiking. His parents, Randall W. and BillyeM. Oefelein, reside in Anchorage, Alaska. EDUCATION: West Anchorage High School, Anchorage,Alaska, 1983. Received a bachelor of science in electrical engineering, fromOregon State University in 1988. Later received a master of science degree inaviation systems from the University of Tennessee Space Institute in 1998. SPECIAL HONORS: High Scholarship Graduate OregonState University, McClarran Award for Strike/Fighter competition. Awarded theStrike/Flight Air Medal, Navy Commendation Medal, Navy Achievement Medal, andvarious other service awards. EXPERIENCE: Oefelein received his commission asan ensign in the United States Navy from Aviation Officer Candidate School inPensacola, Florida in 1988. He entered flight training in Texas in 1989 and wasdesignated a Naval Aviator in September 1990. He then reported to MarineFighter/Attack Training Squadron 101 at Marine Corps Air Station El Toro,California for initial F/A-18 training. Upon completion of training, he was assigned toStrike Fighter Squadron 146 at Naval Air Station Lemoore, California where hemade overseas deployments aboard the aircraft carrier USS Nimitz to the Pacificand Indian Oceans and the Persian Gulf in support of Operation Southern Watch. Whileassigned to VFA-146, he attended the US Navy Fighter Weapons School, TOPGUN,and was assigned as the Squadron Air-to-Air Weapons and Tactics Officer. Oefelein was selected for the United States NavalTest Pilot School at Naval Air Station Patuxent River, Maryland and began thecourse in January of 1995. After graduation in December 1995, he was assignedto Strike Aircraft Test Squadron as an F/A-18 Project Officer and Test Pilot. In February 1997, he went back to the United StatesNaval Test Pilot School as an instructor flying the F/A-18, T-2, and U-6aircraft. In February 1998, he transferred to Carrier Air Wing 8, Naval AirStation Oceana, Virginia where he was assigned duties as the Strike OperationsOfficer when he was selected for the astronautprogram. Oefelein has logged over 3000 hours in more than 50aircraft and has over 200 carrier arrested landings. NASA EXPERIENCE: Selected by NASA in June 1998, Oefelein reported toJohnson Space Center in August 1998. Having completed 2 years of training andevaluation, he is qualified for space flight assignment as a pilot. Recently,Oefelein was assigned technical duties in the Astronaut Office AdvancedVehicles Branch and CAPCOM Branch. Oefelein is assigned as pilot on STS-116,an assembly and crew-rotation mission to the International SpaceStation.